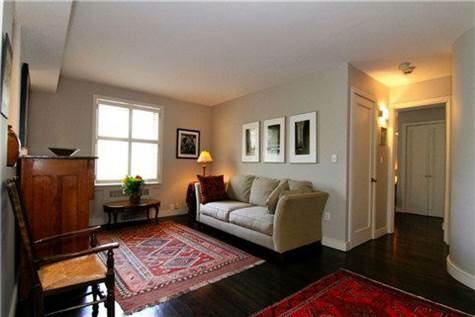 Toronto Real Estate Blog - GTA News : Charming Dupont Apartment For Sale !! Own In Prestigious Toronto Neighborhood! • 2 bath, 1 bdrm single story - MLS® $399,900 - Art Deco Style Building! Avenue/Dupont, Toronto - 855 Squarefeet Of Bright And Renovated Open Concept Design At "The Dorchester"! This Converted Two Bedroom To One Bedroom Plus Den Unit In This Unique Art Deco Style Low Rise Building Just South Of St.Clair Is A Rare Find! Sleek Contemporary Design With Califronia Shutters And Original Hardwood Flooring Through-Out! South West Exposure Makes This Unit Light And Bright Through-Out! Beautiful Galley Kitchen With Granite Countertops Partially Overlooks Combined Living And Dining Spaces, Living Room Includes Custom Built-In Bookcase, While Dining Room Includes Built-In Desk! Bedroom Includes Large Closet, 4 Piece Ensuite Bath, and Window Allowing For Tons Of Natural Light! Extras: Stove, New Stainless Steel Built-In Dishwasher And Fridge, 2 Window Air Conditioner Units, Original Hardwood Floors Throughout, All Existing Electrical Light Fixtures, Halogen Pot Lights. 3 Wall Scones, California Shutters And All Other Window Coverings, Built-In Bookshelves, Built-In Wall Unit With Built-In Desk. Looking to Purchase an Apartment in Toronto? Not Sure Where to Start? There are a lot of Developments - Which One is Right for You? Need Space - Looking for Top of the Line Amenities - Looking for Good Management with Low Maintenance Fees? We Are Happy To Help!